Stanley 84-102 Long nose pliers made from heat treated carbon steel forging for long life. They are ground heat treated cutting edges for longer life, durability and accuracy and have comfort grip handles with polished heads. 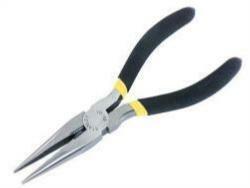 These pliers are ideal for cutting and bending wire.